Jun has been called the “champagne of kombuchas,” a lighter and more delicate cousin of the better known ‘booch. Jun is brewed with green tea and honey, but it’s the jun SOCBY (Symbiotic Colony Of Bacteria and Yeast) that works the magic, infusing the brew with probiotics, enzymes and beneficial acids. Jun lends itself to floral and fruity flavours, my favourite being plum Jun (yes, that rhymes). If you could bottle summer, this would be it. 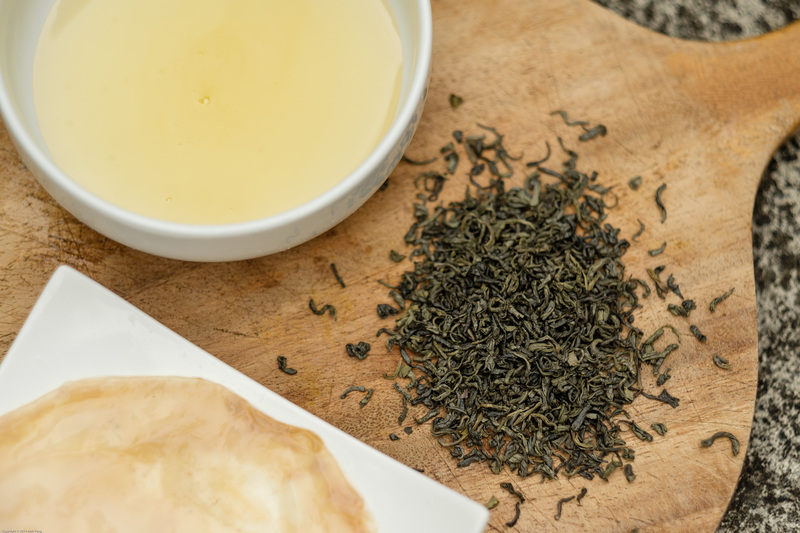 Heat water (80°C is generally recommended for green tea), add to tea and steep for 3 minutes. Strain tea into a bowl, and let cool. Tip: To speed up this process, you can brew a concentrate with about 1/3 of the water, mix in the sugar, and cool it down with the remaining 2/3 of cold water. 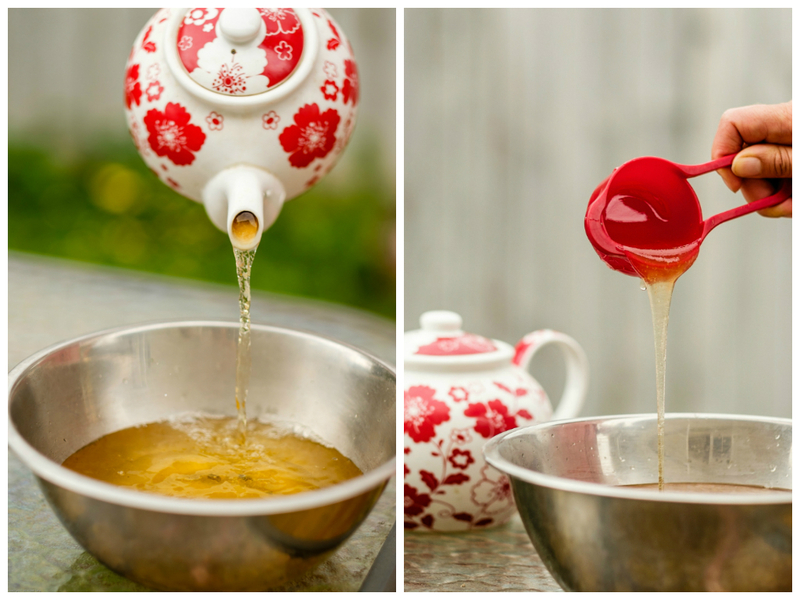 Add honey and stir to dissolve. 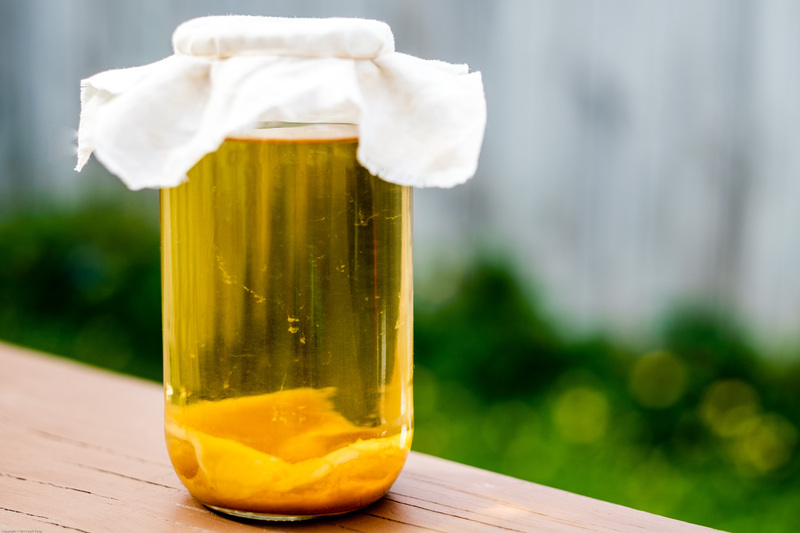 Pour sweetened tea into jar, add brewed jun and scoby (ensure that the tea is not hotter than 30°C before you add the scoby). Cover the jar with a cloth (fruit flies love jun as much as you will!). Place jar in a dark spot, ideally between 15° and 25°C, for 1 – 3 days. The duration of fermentation depends on the temperature and your personal preference. The longer you ferment, the stronger (and less sweet) the jun gets. You can consume your jun when it reaches your desired level of sweetness*, or rebottle it for a secondary ferment to further reduce the sweetness and add carbonation. Don’t forget to reserve some jun with your scobies* to use as an inoculant for your next batch. * Note: A ‘baby’ scoby will form on top of the ‘mother’ every few brews. Separate the layers from time to time. Extra scobies can be stored, covered in jun, at room temperature. Strain the liquid into bottles with screw on lids or flip tops, and add flavouring ingredients if desired. A secondary ferment creates more effervescence, but be careful that carbonation doesn’t build up too much or it may become explosive! Test for carbonation and sweetness every day or so, especially over summer. Once it is brewed to your liking (this can range from a day or two to a week or more) store bottles in the fridge to prevent further fermentation. Tip: Rebottle your jun before it starts becoming too sour. The honey will continue to be fermented out during the second stage of fermentation and the end result will be more dry than acidic.